I first read Animal, Vegetable, Miracle: A Year of Food Life, 5 or 6 years ago. I think it only took a couple of pages to kick-start the longing for my own parcel of useful land. An area where I could plant not only row after row of vegetables to sustain us throughout the growing season (and beyond), but also an orchard with fruit trees, a few rows of grape vines tucked behind the house, and plenty of room for free-roaming hens, roosters, and turkeys that would produce not only eggs, but meat. I can still picture an open room with exposed beams dripping with braids of garlic and onions, bunches of herbs and flowers; heavy sunflower heads with bags tied around the end to grab the seeds. Shelves lined with random mason jars and re-purposed tins. A root cellar stocked with potatoes and tubers that still have earth clinging to their skins. Bejeweled jars of jams and preserves lining the shelves of the pantry, alongside tomatoes, purees, and pickles to carry us through the winter. Half of me is drawn to a "simpler" (yet infinitely more satisfying, I imagine) way of life. A life where all the food we need comes from our own hands, or the hands of those nearby. A life where we give up the things that aren't a necessity. A actual necessity, not a perceived one. My other half knows that that life would leave us little time for the fast-paced world that we're living in now. It would leave us without many of the foods we love and the amenities that we're used to. But a girl can dream, right? And perhaps even find a cozy middle ground somewhere in there? Inspired by Animal, Vegetable, Miracle, and that middle-ground, I made a dish that used seasonal local ingredients, supplemented with a few "extravagances". If you know me, you know that I have no choice but to use winter squash this time of year; it's an obsession. Another favorite right now is kale, and I'm fortunate enough to be able to get some locally grown kale at the market. Shallots, garlic, parsley, mushrooms...also local. Pasta, pine nuts, goat cheese, olive oil...not so local. Preheat oven to 425° F. Line a baking sheet with foil or parchment. Bring a large pot of water to a boil. Remove the thick bottom stems from the kale, and then slice it into 1/4" ribbons. Scrub the squash using a vegetable brush. 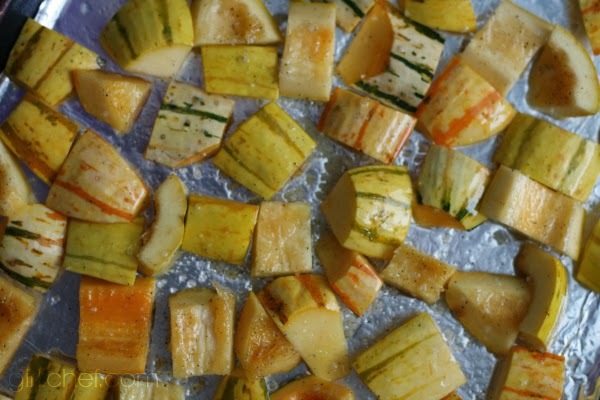 Cut the ends off of the squash, and then cut them into half lengthwise. Scoop out the seeds. Cut into 1-inch chunks and place on prepared sheet. Drizzle with a bit of olive oil, and sprinkle with some salt and pepper. Toss everything around with your hands. Slide into preheated oven and bake until just tender and golden on some of the edges, ~15 minutes. Once the water comes to a boil, salt it, and then cook the pasta until al dente, according to package directions. Drain. In the meantime, heat 2 tablespoons of olive oil in a large, deep-sided skillet. Add the shallots and saute end just tender, 2-3 minutes. Add the mushrooms and continue to cook for another 3-4 minutes, until tender and starting to release liquid. Add kale ribbons, garlic, parsley, crushed red chiles, and a couple pinches of salt and pepper; cook for another 2-3 minutes, stirring. 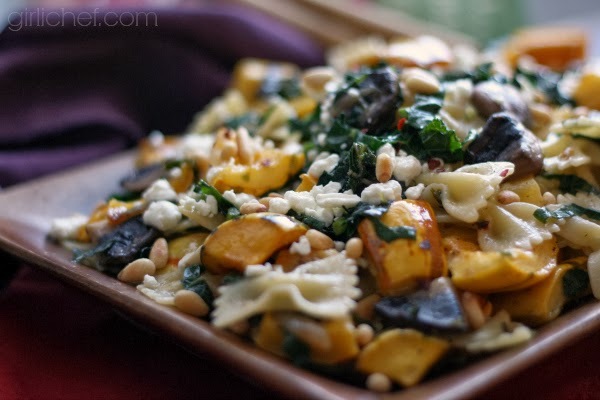 By now the squash and pasta should be done; toss both into the pan and toss to combine. Remove from heat, taste, and adjust seasoning. Just before serving, toss with pine nuts and goat cheese. 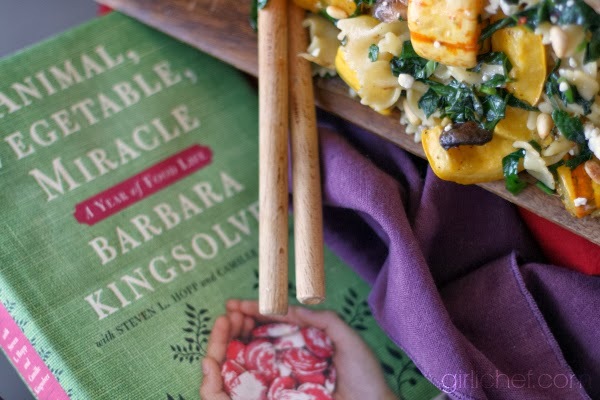 This is my submission to this round of Cook the Books, with the selection Animal, Vegetable, Miracle: A Year of Food Life by Barbara Kingsolver, hosted by Rachel of The Crispy Cook. I'm squeakin' in by the skin of my teeth as submissions are due today. If you missed participating in this round, please join us for our next selection, Baking Cakes in Kigali by Gaile Parkin, which will be hosted by Deb of Kahakai Kitchen. This is also my 12 Weeks of Winter Squash dish for this week. See, I actually do eat seasonally and locally whenever possible. I'm happy to be co-hosting with my friend Joanne of Eats Well with Others, again this year. We'd love it if you'd cook/bake along with us over the next 12 9 weeks. 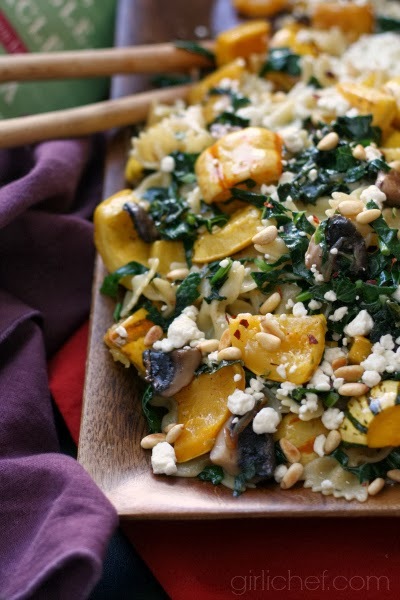 We will be sharing a new winter squash dish every Monday, but you can feel free to link up a squash dish that you've made anytime during the week, as the linky tool will be open through the end of the day on Sunday. Or, if you're a blogger, and would like to post along with us on Mondays, just let one of us know so that we can add you to the group!